Kennard A. Farmer, born September 16, 1927, passed away peacefully September 26, 2005. He retired from the Houston Fire Department as Senior Captain after 25 years of service. He later worked for Farmer Foundation Drilling as anestimator. Kennard was a member of Eastgate Masonic Lodge, Arabia Shrine Oriental Band. He is survived by his wife, Wanda; daughter, Brenda Farmer Williams and husband, John; grandson, William Honshell; daughter, Sharon Lee and husband, Bill; brother, Glyen Farmer and wife, Johnnie; numerous nieces and nephews. Family will receive friends from 6:00 - 8:00 P.M. Thursday, Forest Park Lawndale Funeral Home with a funeral service there in the Family Chapel at 2:00 P.M. Friday, September 30, 2005 and interment following. Remembrance may be made to Shrine Children's Hospital. FISHER – David Charles Fisher, 67, of 224 North Adams died at 9:50 p.m. Saturday in a hospital. He had been a city fireman 32 years. He was a member of the International Association of Fire Fighters, Local 341. He is survived by his widow, Mrs. Ada Fisher; two sons, Dale Fisher and Walter Fisher; four brothers, Tom Fisher and Henry Fisher of Baltimore, Jake Fisher of York, Pa. and Ben Fisher of Sunbury, Pa; a sister, Mrs. Sadie Knause of McConnellaburgh, Pa. and a granddaughter, Miss Margaret Louise Fisher of Hollywood, Cal. Funeral services will be held at 3 p.m. Monday at the Fogle-West chapel, with Chaplain F. M. Johnson officiating. Burial will be in south Park cemetery. Active pallbearers will be E. Prenzler, N. Boudrezux, J. B. Cagle, M. S. Seureau, A. B. Colter and J. H. Gertjan. Fogle-West company directing. Mr. Albert Jacob Fleck, 82, passed away Tuesday Feb. 6, 1979. He was a member of all Saints Catholic church and a veteran of World War I Army. He is survived by daughter, Mrs. Lillian J. Norton of Lake Worth; nieces, Mrs. Mary Anna Weiss, Mrs. Elizabeth Norris, Mrs. Ann Boyle, nephew Charlie Tonn. Rosary will be recited 7:30 PM Thursday Heights Chapel. Funeral Mass all saints Catholic church 10:00 AM Friday with Fr. Bill Bartniski officiating. Interment Perry Cemetery. Heights funeral Home, 1317 heights Blvd. 862-8844. Daniel Lee Fletcher, died March 26, 2006 after an extended illness. Born February 9, 1924 in Fort Worth, he grew up and lived most of his life in Houston, moving to Bryan in 1979. In 1942, he and his older brother, Alfred, enlisted in the United States Marine Corps. Dan saw extensive action, first as part of the Marine contingent aboard the USS Salt Lake City during the Battle of the Komandorskis, then with the 6th Marines of the 2nd Marine Division during the Solomon Campaign, and the invasions of Tarawa and Saipan. Following his military service, Dan became a Houston firefighter, spending over 31 years in the Houston Fire Department including service as an arson investigator and in fire prevention and public education. After his retirement in 1979, he operated a successful restaurant service business in Bryan with his business partner and valued friend, R.E. Thomas. Dan was a straight arrow whose word was his bond, and he dearly loved his country. Surviving is his wife, Robbie L. Fletcher; daughters Sherry L. Fletcher and Ouida Roberts; son Robert D. Fletcher and wife, Denise; 8 grandchildren, two great grandchildren and numerous loved ones related both in blood and in friendship. Memorials may be made to the non-profit Hospice Brazos Valley, 502 W. 26th Street, Bryan,TX 77803. Visitation will be held from 5:00 - 8:00 p.m. Wednesday,March 29, 2006 at American Heritage Funeral Home. Funeral Services will be held at 12:45 pm Thursday, March 30, 2006 at American Heritage Funeral Chapel with Interment to follow in Houston National Cemetery. Edward Lamar Forrest, age 65, went on to join his father, Floyd and mother, Sallie Ann, and his faithful companion “Bear” in Heaven for eternal peace on Monday, July 2nd, 2012 around 7:00 pm in the evening at Conroe Regional Medical Center . Mr. Forrest was born in Chattanooga , Tennessee and is survived by his wife Jarrolynn, his 2 daughters Stacy (Forrest) Camp & husband Rob, Sandra (Forrest) Young & husband Philip, his 2 brothers David Forrest & wife Pam, Randy Forrest & wife Debbie, and his sister Robin (Forrest) Dunne & Husband Chris. He also leaves behind 4 grandsons Blake Forrest, Brendan Camp, Payton & Parker Young. He also leaves behind numerous nieces, Tiffany (Forrest) Peterson, Lisa (Forrest) Magsig, Jennifer Kennedy, Lisa (Kennedy) Hughes, Kaitlin & Alyssa Dunne, MANY close friends & neighbors, and his current companion “Sasha.” He is also surived by his former wife and lifelong friend Billie Forrest. Edward is a Vietnam War Veteran where he served our country for over 2 years through 1969 as Specialized Rifleman and aiding in the resolution of the conflict. Upon his return stateside he wasted no time seeking out a profession of helping people in their most dire time of need by volunteering with Harris County Emergency Corps prior to becoming a full-time firefighter/paramedic/E. M. T. for the City of Houston that he served for over 6 years up until a fall from a ladder truck while on all to a fire at Sharpstown Mall forced him into retirement early, while his passion for helping people and utmost respect for the City of Houston and its servicemen was unwavering. Shortly after his retirement from the City of Houston, he went on to study theology and was ordained as a Baptist Preacher in 1989 from Southwestern Baptist Theological Seminary in Ft. Worth, TX and served the ministry as a traveling singing evangelist for over 2 years and as a Pastor for over 10 years before retiring from the profession. After retiring from preaching, Ed dabbled in numerous entreprenerial ventures, including, but not limited to, Real Estate, Satellite Systems, and a Texas State Licensed CHL instructor which he was extremely passionate about. He moved to Willis , TX in 2004 to fulfill a lifelong wish of “enjoying HIS lakeside view from HIS Veranda,” which he is now doing eternally and peacefully. We Love and miss you Mr. Ed. Anthony W. Foster Sr. age 50, passed away peace fully with his family present on (Sun) 04-26-09. He was a retired veteran for the City of Houston Fire Marshall. Visitation will be held (Sun) 5-3-09 from 12N-2PM at Houston Central Seventh-Day Adventist Church; 9425 W. Sam Houston Pkwy North. Funeral Services will begin at 2PM. Interment: Houston National Cemetery. Mon - Gate Time 1:30PM. Joseph Dudley Fritsche, 39, of 1504 North San Jacinto street, fireman, died in a local hospital at 1:30 A.M. Saturday. Mr. Fritsche was born in Louisiana and had been connected with the Houston fire department since 1913. He was a captain and in charge of No. 2 fire station at the time of his death. He is survived by his mother, Mrs. Blanche Fritsche, and three sisters, Mrs. J. L. Trahn, Mrs. W. H. Douglas and Mrs. Joe Romoleski, all of Houston. Funeral services will be held at the chapel of the Fogle-West company at 3 p.m. Sunday, Rev. T. J. Windham officiating. Burial will be in Forest Park cemetry. Active pallbearers will be Assistant Chief G. W. Richardson, Battalion Chief D. W. Heath and City Firemen L. Templet, J. B. Cagle, F. C. Cartino and J. Burrell. 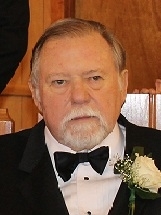 Charles "Bob" Robert Fuller, 71, of Splendora, Texas, passed away on Tuesday, June 23, 2015. He was born on Thursday, February 10, 1944, in Houston, Texas, to LeRoy Fuller and Imogene Thelma Morris Fuller, both of whom have preceded him in death. He was also preceded in death by his sister, Daisey Jeannette Hunter. Bob served in the United States Navy for four years with the ranking of SK3 (E-4). Bob retired from the Houston Fire Department as a Junior Captain and later retired from Montgomery County Precinct 4 as a Chief Deputy. He was a life member of the American Legion #615 New Caney, Texas, VFW Post 4816 Porter, Texas, and a life member of the North American Hunting Club. Left to cherish his memory is his loving wife of 49 years, Mary Ann Fuller; daughters, Michelle Yvette Holy and husband Darrin, Dianne Yvonne Lewis and husband Anthony; brother, Mack Leroy Fuller and wife Mary; sisters, Sharon Jean Hooper and husband Kenny, Deborah Kay Keepers and husband Chuck; brother-in-law, Jimmy Hunter; grandsons, John Walter Holy, Robert "Bobby" Andrew Holy; granddaughters, Jessica Marie Lewis, Rayna Brooke Lewis; along with countless other loving family and treasured friends. Visitation for Bob will be held at Neal Funeral Home on June 28, 2015, from 4:00 pm to 7:00 pm. Funeral Services for Bob will be held at Neal Funeral Home on Monday, June 29, 2015, at 11:30 am. Interment for Bob will follow at Houston National Cemetery. In lieu of flowers, memorials can be given in Bob’s name to VFW Post 4816 - 24411 Cunningham Drive, Porter, Texas 77365.